need help with the tuition. What resources are available? There are two main sources of financial assistance for families interested in sending their children to Catholic school—the parish and the Catholic Education Foundation. Questions of financial assistance should be first directed to the pastor or principal of the school. Many schools will have assistance available. Additional financial assistance may be available thru the Catholic Education Foundation. The Foundation provides grants to more than 1000 students in elementary and high schools. Students are awarded scholarships based on financial need, which must be verified thru an application. For more information about the Catholic Education Foundation, go to our website, “like” us on Facebook, or call our office at 815-834-4023. I’m a product of Catholic Education. My teachers were mentors and role models and I’d like to give back. Can I make a gift in honor of my favorite science teacher? We were all fortunate to have favorite teachers who made a meaningful impact on our lives. Making a gift in their honor or memory is a wonderful idea. There are many ways to make a gift to honor a favorite teacher or memorize a loved one. The Catholic Education Foundation (CEF) conducts an Annual Campaign each fall and encourages outright gifts of any denomination with a corresponding honorarium or memorial. With the permission of the donor, these names are listed each year in the CEF Annual Report. Planned gifts throughout the year can also be established in the name of someone close to the donor. Such planned gifts may include, but are not limited to, charitable trusts or gift annuities that pay the donor an income for life, or an endowment fund to benefit a restricted school or parish. Please contact the CEF for details, 815-834-4023. We have just moved to the area and are interested in finding Catholic Schools for our kids, ages 4, 9 and 14? Our local parish has an elementary school, but what about my preschooler and my 9th grader? Welcome to the Diocese of Joliet! You have several options for your family. And there are several places you can start. The website for the Catholic Schools office has a list of every Catholic preschool, elementary school and high school in the diocese. But a conversation with your local parish would also be a good first step. Many of our elementary schools have wonderful preK programs for 3 and 4 year olds. And we have 7 outstanding catholic high schools in the diocese. A conversation with the parish, school principals is the best way to start this process. Or, you’re welcome to call our office (815-838-2181), and we will help you identify the schools that are closest to you. I’d like to teach in the Catholic Schools. What credentials do I need? Can you give me some sense of the size of your diocese? How many schools? Over what area? How big? How many? 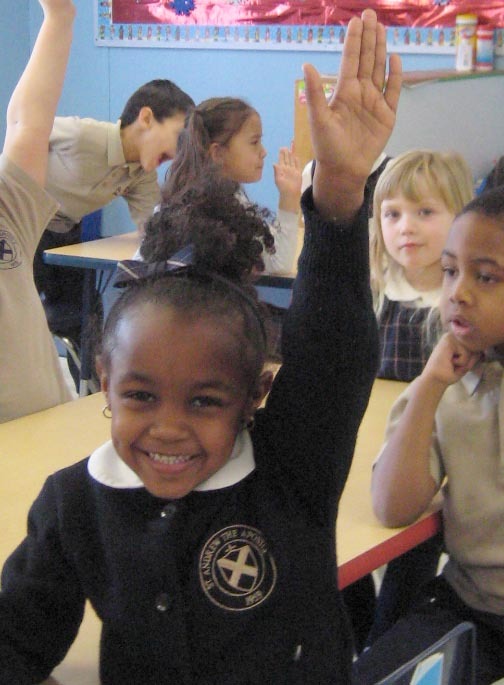 There are 62 pre-schools, elementary schools and high schools that make up the integrated network of Catholic Schools in the Diocese of Joliet. More than 22,000 students are educated everyday within five collar counties of diocese. Using 2009-2010 statewide average operating per-pupil expenses for local public school districts, the savings to the municipalities within the diocesan borders amount to more than $90,000,000 for elementary schools and $84,000,000 for high school schools. In every major test grouping the diocesan school students achieved scores above the national average. This also applies to ACT score comparisons. Families from the 48 parish schools within the diocesan five county border receive more than $1.3 million in tuition assistance from the diocesan Catholic Education Foundation. Each year parishioners provide more than $16 million of subsidy, by way of grants and scholarships, to schools that cannot sustain themselves and families that need tuition assistance.